Not only do they save you money on buying already sliced food, but meat slicers make sure roasts and steaks are cut to perfection as well. For occasional cooks and enthusiastic chefs alike, meat slicers add convenience and function to your kitchen - making slicing easy. However, choosing the right brand, out of so many options, may not be that easy. Until now! 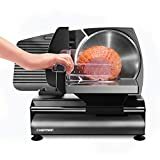 We have put together this meat slicer buying guide with everything you need to compare, review, and choose the best meat slicer for you. 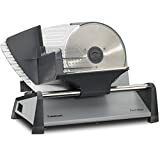 Manual Meat Slicers: Slicing by the user moving the meat back and forth over the blade, manual slicers are easy to use and a cost effective slicer choice. Automatic Meat Slicers: Automatic meat slicers take all the work out of the slicer by moving meat automatically with a motor. Often allowing for both automatic and manual operation, these slicers offer more variety. 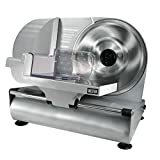 Variability: Meat slicers that not only slice a variety of meats but also non-meat products, such as cheese, are crowd favorites among online reviewers. Cleaning: Meat slicer owners rate their products higher when they are easier to clean. Units with dishwashable parts are by far the most popular, however non dishwasher-safe units that easily come apart for simple cleaning are a close second. Choosing a top brand with good cleaning reviews will ensure you find an easy-to-clean meat slicer. 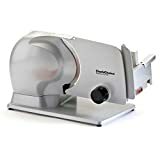 Safety: Safety is a big concern for online meat slicer reviewers, and slicers that don’t have a good quality food glide handle are not reviewed well, since owners don’t trust the security of their product. Compare the top brands’ specs and reviews to make sure you are buying a quality meat slicer. Build: Build is an important reviewing topic of meat slicer owners. 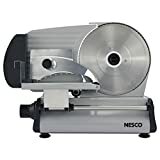 Owners note that plastic units that are smaller and not too heavy are much more convenient to use and move around, however heavier metal slicers in general are reviewed higher on durability than those that have mostly plastic parts. Safety should be your first concern. There are a variety of features that enhance the safety of a slicer, including a no volt release on automatic models, which will require the cook to push a button to commence slicing after power has been disrupted or the appliance has been switched off for cleaning purposes. Most meat slicer blades will range from 8 to 14 inches. For home kitchen use, 10 inches will work perfectly but for professionals, a 12 or 14 inch is better suited. The thickness plate will determine how thick your meat will be sliced. These range from paper thin to about 1 inch in thickness. The bigger the carriage of a meat slicer, the more thickness plate options you will have. 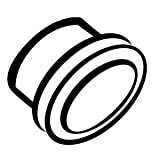 Most meat slicers require a small degree of maintenance, from cleaning to regular lubricant use. A meat slicer with dishwashable parts will save you a lot of hassle. How much storage and counter space do you have? Meat slicers vary in size, so considering space restrictions beforehand will help ensure no storage inconveniences. A handy tip includes measuring the height of your storage cupboard shelf compared to the height of the slicer to make sure your new slicer will fit. Size vs speed. The bigger the machine, the more speeds and added features it will have. Smaller machines with fewer settings, though, are more compact for better storage in small kitchens. Electric meat slicers can be corded or cordless. Cordless slicers will offer more freedom of movement while corded are the most cost effective choice. The horsepower of an automatic meat slicer will determine how fast the slicer will cut the meat. Chard: Chard was founded in 2009. They specialise in everything from outdoor cooking to game processing products, and make food preparation appliances, such as meat slicers, aimed at enhancing consumers’ cooking experiences. EdgeCraft: A leading meat slicer brand, Edgecraft’s Chef’s Choice brand is a renowned quality kitchen appliance name. Founded in 1984, they have a large selection of kitchen appliances, including sharpeners, slicers, and waffle makers. Waring: After introducing the first American blender, Waring has become a leading manufacturer of quality kitchen appliances for the home and hospitality industry. Their top rated meat slicers are among the products they have proudly produced over the last 75 years.